Expand My Thinking: Something is Rank with the Rankings. It’s that time of year again, when a so-called "think tank" organization releases their annual B.C. school rankings and various media outlets publish these findings as if they were factual. 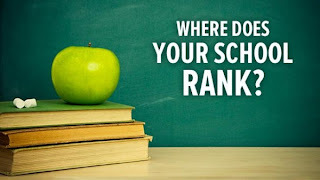 Other than a sentence or two that the teachers' federation or other educational organization “is critical" or that they are "controversial”, the rankings are rarely scrutinized. Sound bite media makes for a good headline and requires very little thinking. The 2014 report contains very brief summaries of each secondary school in B.C. and ranks them from 1 to 293. Some may think that the rankings are needed transparency and "good for the system"; however, they are both invalid and insidious in their attempt to undermine many schools. The organization that produces the rankings has offices in Calgary, Montreal, Toronto and Vancouver and their right wing mission is promoting “a prosperous world where individuals benefit from greater choice and competitive markets.” Somewhat ironically, as a non-profit organization, they operate partially from grants and tax-deductible donations from patrons (you can be in the 'Founder's Circle' for $10,000). As aggressive advocates for choice, they promote independent schools and consistently “rank” them ahead of public schools. They claim that the rankings "empower parents with objective information about school performance." Of course, as soon as they "rank" very different school communities and school systems using the same criteria, all claims to objectivity are completely untrue and, frankly, bogus. Using the most recent international achievement data, schools in British Columbia are doing very well and overwhelmingly, kids attend and engage in their learning to the best of their ability. To “rank” schools from vastly different communities as well as public and independent schools using the same criteria produces results that are invalid, unreliable and incomplete. According to this organization, the top 21 schools (2013) in B.C. are ALL independent schools. A closer look at the data reveals that only four of these so-called top schools had a Grade 12 enrollment over 100 and 14 had grad classes under 75 students. Incredibly, the school ranked "8th best in B.C." had a 2013 grad class of 18 students. More significantly, of these top 21 schools, only four reported having any ELL learners and none of these schools reported any learners with special needs. The annual list includes schools that screen student applicants and only accept learners if their entrance test results, gender and/or ability to pay the tuition fees meet the standard. The top ranked school in British Columbia is an exclusive, girls-only institution with a Grade 12 enrolment of 60 students. The tuition at this school is $18,200 per year, plus a $2500 new student entrance fee. Families can expect to pay at least $250,000 in tuition and school fees to have their child attend this school from kindergarten to graduation. Secondary school applicants write a 2-hour math/problem-solving, reading and writing entrance exam and most then sit for an interview. If you do not meet the standards, you do not get in. Like most of the "top 20", this school reports zero English Language Learners (ELL) and no students with special needs or learning challenges. I am confident that this is an outstanding school with great traditions; however, you cannot use the same criteria to compare and then rank schools that require students to apply and meet entrance standards with public schools that welcome and accept all learners. (Indeed, taxpayers should ask why our provincial government subsidizes these independent schools, especially those that exclude kids, with public money - when public schools, open to all, could use better funding). To be clear, this is not about making excuses for public schools. Like all of my colleagues, I work at an outstanding public secondary school and our highest achieving students can and do perform as well or better than the top students from any school, anywhere. More importantly, we help all of our learners achieve success at impressive rates. Last year, 263 Grade 12 students from diverse cultural, socio-economic and language backgrounds attended our school and our graduation rate was 96.6%. The average Grade Point Average of our graduating students was 3.18, or in the 93rd percentile of the province. 67.2% of the 2013 class graduated with honours (defined by the Ministry of Education as a GPA greater than 3.0) while the rest of the province, including all independent and public schools, showed 51.2% of grads achieving honours standing. However, not all students want to go to university and, increasingly, a university degree is not a guarantee of a 'better life'. In our diverse communities, kids come from all kinds of backgrounds and have different interests, abilities, goals and aspirations. For many families, attending an independent school is just not an option for their children. At public school, the overwhelming majority of kids are also engaged in one or more of the arts, music, theatre; business education and info tech. ; woodwork, automotive and metal shops; work experience and apprenticeship programs; clubs, athletic teams, choirs, bands and in a myriad of positive leadership events in ever increasing numbers, all while school graduation and completion rates are higher than ever. None of this is measured by the rankings. As for university bound students, the admissions offices at both the University of British Columbia and Simon Fraser University have stated that they do not differentiate between public school and private school applicants. Former U.B.C. math professor George Bluman has tracked the results of first year math and physics students for a number of years and found that public school students typically outperform students graduating from private schools. He suggests that private school students get a lot of support as the school’s have a vested interest in exam results (the main criteria used to rank schools) and the independence required of first year university students presents a greater transition for some. Research has demonstrated that public school graduates do as well or better at university than private school graduates, including so-called university-prep schools. This is an important part of the public school mandate, however, it is not our only job. We also help all learners find a pathway to success in the future, at a variety of post-secondary institutions, apprenticeships and careers. While they ranked our school again this year, no representative from this organization has ever set foot in our building and they know very little, if anything, about our school community. They generate rankings to promote 'school choice' (i.e. independent schools) and believe schools are improved by competing for enrollment. I am not opposed to competition as it has a place in our society and is the norm in the business world. However, competition creates haves and have-nots and winners and losers. The United States of America is one of the most competitive, free market societies on the planet, and the struggling state of public education and general poverty in many American jurisdictions is well documented. The education of children should not be operated on a competitive business model where we accept that some will succeed while others will not. High quality education that is accessible to all is an investment in the future of our democratic society. All school’s achievement results should be published and available to everyone. Holding schools accountable for how kids are doing is important and the data on student learning should be shared with parents and used by educators to plan for improvement. Results and school data should be presented objectively and the public can draw their own conclusions. As soon as you "rank" schools, the data becomes irrelevant, even when the differences between a so-called top and lower ranked school are only a percentage point or two. You cannot reliably rank schools that have limited enrolment and only accept certain students using the same criteria as schools that accept all learners. Finally, all schools are so much more than a narrow band of results on five provincial exams, including three that students write in Grade 10. There are many exemplary independent schools and they offer a different education, but not a better one. The very future of a healthy democracy in a diverse, pluralistic society relies on sustaining excellent public education, accessible to all. Schools have a primary responsibility to nurture the cognitive abilities of young people to increase their life chances. However, our role is not merely creating a "prosperous world where individuals benefit", but also in building a democratic nation of socially responsible and engaged citizens. In Greater Vancouver, our excellent public schools are a reflection of our society: vibrant mosaics of people from many cultures and socioeconomic backgrounds. Young, educated citizens from inclusive schools will be advantaged in our increasingly diverse and interconnected world. Indeed, strong economies of the future will rely on a work force that can communicate, think, problem solve and work collaboratively with women and men from around the globe. What better place for students to gain this experience than by engaging and learning with a broad range of other youth in a diverse, high achieving public school? If you really want to learn more about a school, call the principal and ask if you can come and visit, in action, when students are in attendance. Find opportunities to talk to teachers, staff and parents of kids at the school. You will be far more informed than any ranking will ever tell you and I am confident that you will be impressed with all you see and hear.